Penny: So, how many people listen? Wil Wheaton: Most people download it later, but usually a few thousand people listen live. Penny: What? A few thousand people listen to you talk about nerd stuff? Wil Wheaton: Again, right in the ears, straight to the feelings. Note: This post is cross-posted from my podcast’s website, How Good It Is, with a few edits so it makes a little sense. A few people have asked me about the what sort of stuff I go through when I put my podcast together, so I figured it would be fun(-ish) for me to take a closer look at the entire process and share it with you. I’ve long had an interest in radio. When I was in college in the early 80s I spent inordinate amounts of time at WBAU, the radio station that was run by students at Adelphi University. (WBAU went dark in 1995, and that’s a whole other story). I thought I would go into broadcasting, but a few things, rather ridiculous ones in retrospect, got in the way and frankly I floundered for a few years. But I never lost the bug. And most people agree that you never do. So, finding a way of combining the two has been a little bit of a conundrum for me. I’ve been listening to podcasts for several years now. Marc Maron’s WTF was one of the first, and coincidentally I was one of his first listeners, because I started searching for my first podcasts to listen to only a few weeks after he started his podcast. (The Maron thing is a little bit of an aside and I’ll come back to it in a bit.) One of the other podcasts I adopted early on was Cerphe Colwell’s progressive show, which was a couple of hours of music that was pretty much in my wheelhouse. That show moved over to a different platform and I was still using an iPod, so unfortunately we had to break up. But Cerphe’s show was the first inkling I had that I could do a music program, and do it on my own terms. There was another one I listened to pretty much from the beginning, but it got kind of stale and, while it’s still running, that’s largely because it’s got a band of rabid fans that are, frankly, living in the past and haven’t figured out that the show has refused to evolve. Life got in the way for a couple of years, what with relatives getting sick and dying, so nearly everything went by the wayside. But a few months ago I started thinking about it again. And it was around this time that I started looking a little more closely at other podcasts to see what they were doing, and how they were doing it, and how they sounded, and a number of other things. I wanted to do something that had a specific focus (unlike the blog), and had a topic about which I could talk knowledgeably. I came up with a few ideas and crowd-sourced it a little bit, and the one that I liked best, AND had the advantage of not being like a lot of others, was this one. I also crowd-sourced the title of the show, which I’d lifted from something I’d seen on Allan Sniffen’s website, and despite this, he was nice to me in my first couple of weeks. A few people came up with alternative names, but what they had was either already taken, or I couldn’t get the domain name. Plus it was growing on me day-by-day. I also need to give a shout-out to my fellow WBAU alumnus Doug Miles, who DID make the cross over into professional broadcasting. He’s got the Book Talk podcast, and he covers the Orioles Spring Training season down in Sarasota, and he’s got a bunch of other stuff going on pretty much all the time. He took the time to give me a bunch of pointers on getting the thing up and running. Eternal thanks to him for his encouragement. Some people have suggested that it’s a lot like Song Exploder, and in a way I agree in the sense that Hrishikesh Hirway also concentrates on a single track for each podcast, but he’s got a different format, and he sticks to more recent tracks, whereas I’m reaching back for the older stuff. So, we’ve each got our little corner of the genre staked out. I did a LOT of planning ahead on this, including mapping out something like the first ten episodes, because if I couldn’t sustain that much, then what was the point? To be honest, I lost the list and had to re-do the advance planning, but being able to do it again, and with largely different stuff, meant that I was probably onto something with the longer-term prospects of the show. I got a format together, I figured out what I wanted it to sound like, and I started shopping for equipment. The first couple of shows were recorded in my dining room, on summer days when Wife was out of the house and the dogs were outside. I’d have to stop recording every time the air conditioners came on, or shut them off and put up with the heat. I decided, however, that there was still too much ambient noise in the area because my house has a semi-open floorplan to it, and I still sounded kind of “live”. Plus, I had to assemble everything and then take it apart again after each recording session, and I could see where that would get a little taxing on my cables and such. So I moved the entire setup into my basement, where I could put it together and leave it there. 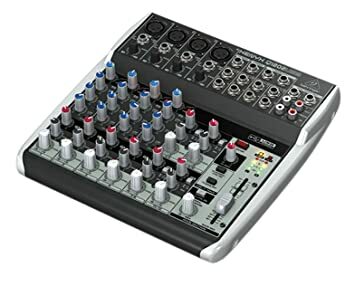 My first purchase was the Behringer Xenyx Q1202 12-channel mixer. It’s probably more than I need, input-wise, but I’ve also got the flexibility I’ll need to implement some ideas I have for future shows. And at about a hundred bucks, it wasn’t breaking the bank. 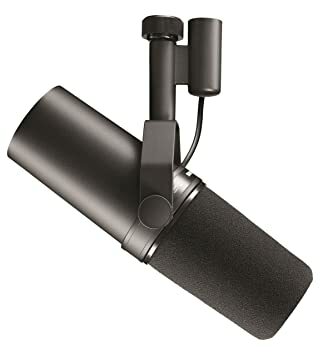 I’d also purchased a couple of Behringer Ultravoice XM1800S microphones, but in the end I didn’t like the way they sounded. (They’re going to come in handy for a future project or two.) Until now I’ve been working with Wee One’s Shure SM-7 microphone. I DO like the way it sounds, but after all it’s not my mic. So this week I ordered one of my own, and I decided to take a step up. Come next week, How Good It Is will be recorded using an Electrovoice RE-20 microphone, which is my favorite of all time. I also purchased a shock mount to go with it, because I’m not going to be in a basement forever, Mom. I have two other elements that I use. One is to help improve the sound and the other is to keep the production going smoothly. The first is acoustic foam panels. Wee One got me a bunch of them as a Christmas present, which I mounted to doubled corrugated cardboard, and I purchased a second set and mounted those as well. 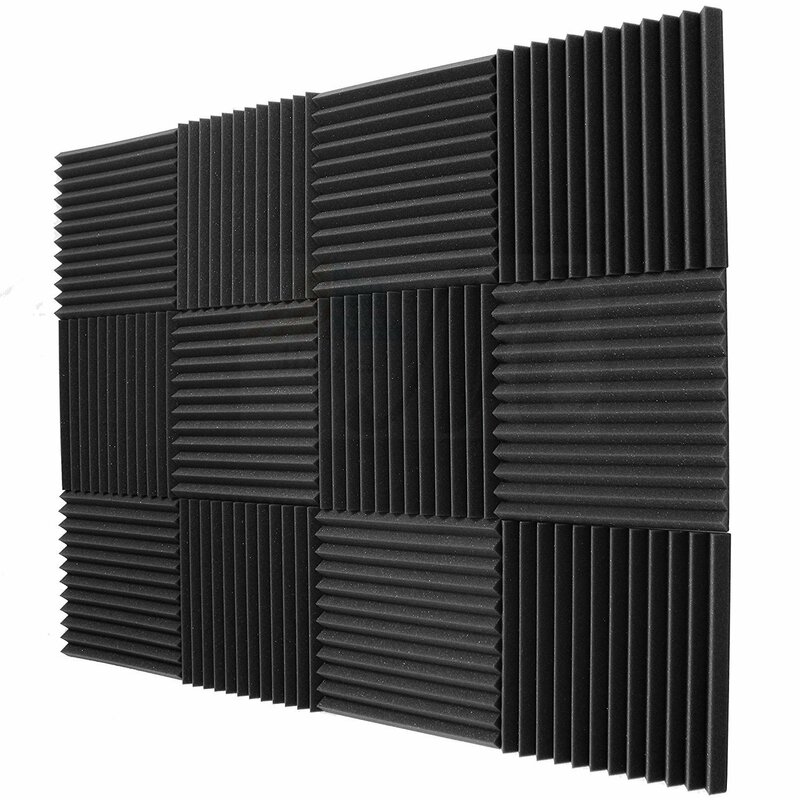 So I record, surrounded by these two-foot-by-six-foot cardboard panels with acoustic foam on them, to help cut down the ambient noises. I’d take a picture of the entire setup, but one of the laptops isn’t attached to the studio permanently; in fact it’s the one I’m typing on now (back in the dining room, am I). So next week I’ll take a photo and post it for the curious. The show is very produced compared to other podcasts; I like to have some kind of stuff going on most of the time, which is a holdover from my radio style. That also means that the show is rather heavily scripted, because in many cases I’m timing things tightly. So editing the show usually takes a little while, but Soundboard has cut down on that and lately I’m just stitching together my beginning, middle and end. Once in awhile I’ll screw up and either re-do the entire segment I’m recording or, if I can find a decent point to edit, I’ll go back to that point and start over. I’m kind of proud of the fact that most of my edits are pretty invisible. I was good with physically cutting tape back in the day, and I’ve got a good ear for doing it digitally as well. Once the show is edited, I upload it to a website called Auphonic for audio. Because the show is short, I can do all of my processing for free. But if it were longer, I’d pay for it because it’s made a huge difference in the show’s sound. From there, I upload it to this site, and to Podomatic, where the show is hosted, and it’s from there that your podcatcher gets it. I write up the post for this site and publish it, and after waiting a little while I publicize it on Facebook. The reason for the delay is that I’ve discovered, if I try to post on FB right away, Facebook can’t find the images. And sometimes it can’t even find the post! So I give everyone a little time to figure it out. And now we get to the part where you come in! You, my faithful listener/reader (and you’ve GOTTA be pretty faithful if you’ve gotten through nearly 2000 words and you’re still with me), will either read my Facebook post and come here directly, or you have iTunes or Spotify or some other pod organizing software, and it gets (usually) automatically downloaded to your device. At this point I still don’t have a huge number of listeners, but that’s OK because the feedback I’ve gotten has been almost overwhelmingly positive. My strongest critic is my brother, who listens to a few at a time and then calls me to tell me what sounds crappy, and more often than not I agree with his assessments and have made adjustments. So how do I decide what songs to cover? There are a few songs where I know there’s an interesting backstory, and those come pretty easily. Other times, I’ll hear a song and just wonder if they have a story to them, and then the research begins. Occasionally I’ll hit a dead end (that is, there isn’t really much to tell), but that leads me into another story. Once in awhile I hear a bit of trivia on a radio show and that encourages me to dig a little deeper. (“Get Together“, Episode 4, is a good example of this.) And every now and again I look at what I’ve covered and see if I need to go in a different direction for awhile, e.g. have I done too many songs from the 60s and ignored the 50s? Have I concentrated on male artists too much? Rock vs. ballads vs. doo-wop vs. some other genre? A couple of people have made suggestions, and one of them has already been turned into a show (H/T to Kevin), and another has given me an idea for something I want to do later, in the springtime (another H/T to Jerry). For what it’s worth, I’m always open to new ideas, whether it’s about the sound, the content or some other detail (should I do more trivia questions?). I’m always happy to see comments and suggestions, whether it’s here or on the Facebook page. Finally: a couple of people have asked me about monetizing the podcast somehow. That’s not my immediate plan; unless the show grows immensely in popularity, it’ll be a relatively inexpensive hobby for me. If I have to start paying for additional bandwidth and such because there are so many downloads, then I will have to think about doing something like that, but I’ll try to do it as unobtrusively as possible. The aim would be sustaining rather than profit. One of the big takeaways I’ve gotten from this whole project is that it’s good to have something else to look forward to, that’s vastly different from everything else you do. And the other thing is something I’ve learned from several years of listening to Marc Maron (see, I told you I’d come back to him). His show was born out of the ashes of his previous job. At that point he was a mid-level standup comic and radio host, who lost the radio gig when his entire network, Air America, took a huge financial crash and went belly-up. But from those pieces he managed to rebuild—indeed, vastly improve—his career and, it seems, repair his personal life right in front of his audience. I’m not in that level of dire straits, thanks, but it taught me that there are always second acts, that there’s always redemption and a positive future, if you make the reach for it. This post has been an incredible exercise in procrastination (hey, it was either this, or I start writing next week’s show), but it was also kind of fun for me to put together. Thanks again for all your amazing support, and for letting me into your head every week.